It’s been hard to sit and write lately because there are so many pressing things going on. I work very full days, I volunteer once or twice a month, I grow and cook food, and I have a house and yard to keep up by myself. But as busy as my outside-of-work commitments make me, I really love them. One “hobby” that I’ve really missed over the past several months is keeping chickens. Last fall I decided to take a break from having a home flock. 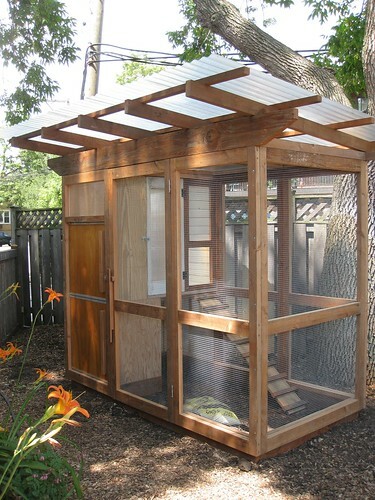 It was nice having time to reassess my coop and run set up, and to make some much-needed changes to it. It was also a good winter to take a break from tending a flock; I don’t know how I would have been able to tend to the hens in their Eglu coops when the blizzard rolled through this year. But I missed the amusing antics of chickens in the yard, not to mention the high quality eggs. Here I’ll confess something that may shock the more frugal folks who occasionally read this blog: when I buy eggs, I typically pay nearly $7 a dozen. Really. Sometimes I’m lucky enough to get some eggs for less than that at the farmers market, but I haven’t been making it to the markets very often this year due to my other commitments (work, volunteering, etc.). So when I have to buy eggs at a store, I buy them at Whole Foods where I can get a brand called Vital Farms. These are the closest thing to backyard eggs I’ve found at a major grocery store and I will gladly pay the extra money for many reasons. 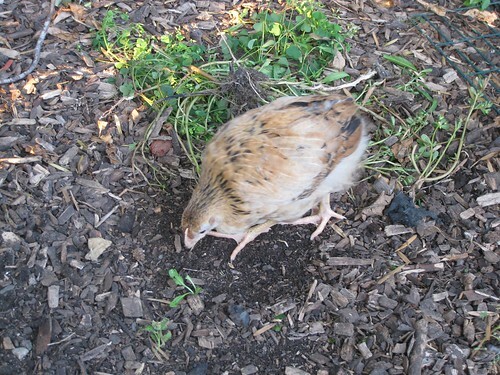 I first became interested in keeping hens because of their usefulness to my first big hobby: gardening. They eat weeds and bugs, and they produce excellent fertilizer for the garden in return. Oh, and they give you tasty eggs. Win/win/win! But to me there are also ethical reasons for not buying standard store eggs. The hens that lay those cheap eggs are treated horribly, and the eggs themselves are bland and tasteless. Once I got my first hens, I also found out how fun they are. They have distinct personalities and are amusing and calming to watch. So that’s what I was doing tonight after I stopped working, and just before the sun set: relaxing by watching my new flock of little hens. I opened up their coop door to let them roam the big yard and watched them busily scratch, peck, stretch their wings, and explore, all while making soothing peeps and clucks. Below are the oldest of the little hens. Honey is about five weeks old and is my favorite. She was an “impulse buy” because I hadn’t planned on getting six chickens, but she was cute and lonely sitting by herself at the store. She was obviously hand raised as a pet because she likes to sit on my arm and be held. Technically I didn’t buy her, and the store owner gave her to me since she knew I’d provide Honey a good home. But she still was a big impulse acquisition and so far I’m glad I gave in. Emma is in the foreground and Jane is in the background. 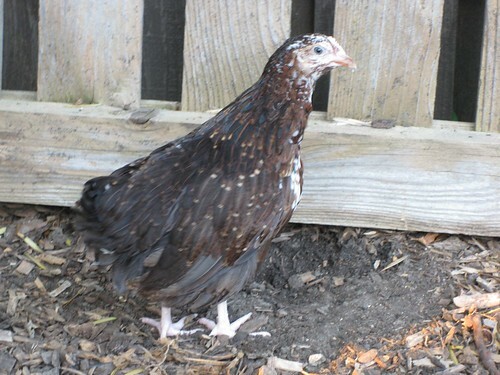 Both are a breed originally from England called Speckled Sussex, so they’re named after Jane Austen characters. They’re about eight weeks old now. Emma is the bossiest and I think she has established herself as top of the pecking order for now. She isn’t really red; that’s just the way the light was striking her feathers at the time. Here’s another photo of Jane. 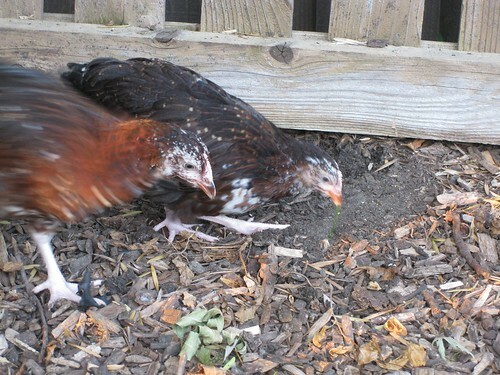 It’s very hard to take photos of chickens since they are almost constantly moving. This was a rare time when she was standing still for a few seconds. In addition to these lovely young hens, I have three more chicks that are about one week old living in a brooder set up in my basement. No photos of them yet, but I’m sure to get some soon. I rode my bike to work today. This is what it was like. I left just after 6 AM. The morning was still cool. If I had walked to the train, I likely would have worn a cardigan, but since I was riding and would get warm from exertion I just wore a t-shirt with a pair of cropped pants. Safety is important to me, so I wear a helmet and a bright yellow vest just like the construction workers wear. The first two miles are easy and familiar. I rode this way just last week to visit a friend at her apartment. Traffic is light, but I remain alert to cars parked next to the bike lane; I wouldn’t want to get doored. There are other cyclists that pass me, but at this point of the ride there are only a few about. The ones I see are decked out in true cycling gear, riding bikes with thin tires and pedals made for those special shoes. They are all men. I stop at the complicated intersection of Elston, Damen, and Fullerton. I realize I am at the halfway point of my ride and I’m glad because I am tired. This is the first time I’ve cycled to work in about a year and I’m not conditioned to it. I have also had no breakfast and no coffee. The road is rough for the next mile and I try to steer around the ruts and holes without moving too far out of my lane. When I stop at lights, I drink deeply from my water bottle. There are cyclists who don’t want to stop at signs and lights. As they approach stop signs they don’t even pause; at red lights they jostle and slip through the intersection if there is the slightest pause in traffic. I stop at every light and wait for it to turn green. I slow and pause at stop signs, not taking the right of way as the other cyclists do. But then again I need these rests to drink and to slow my breathing. It occurs to me that these other cyclists are likely 15 years younger than me. As I merge onto Milwaukee Avenue I encounter many more cyclists. They are all young and coming from the Chicago’s equivalent to Brooklyn: the Wicker Park, Bucktown, and Logan Square neighborhoods. They’re dressed in the uniform of the young and hip: jeans, graphic t-shirts, and messenger bags. They are riding street bikes that either are vintage 1980s or have been made to look like them. Many of them are not wearing helmets. Riding Milwaukee up and over the Kennedy Expressway I gear down lower and lower. I am struggling, but I make it. At the Des Plaines Avenue bridge I get off my bike and walk for a block. I am too fatigued to attempt the steep ascent and the lane change just after the crest so I can turn left onto Fulton. But I’m back on my bike again after a few minutes and ready to finish the journey. The last mile must be taken leisurely as I negotiate around buses and pedestrian traffic. Pedestrians are a challenge for cyclists. They apparently see us as less of threat than cars and are more likely to step out in front of us; they have more faith in my ability to brake quickly than I do. At my office building at last I park in the bike room, unhitch my trunk bag and panniers and head up to the gym to shower. I am red-faced and sweaty, but I have a schedule to keep. I’m in my office less than 30 minutes later with some breakfast and coffee. I work through the day. When it is time to leave I change back into my riding clothes in the rest room. There is no rush now because I have plenty of time to get where I am going next. I begin to back track my route: Adams, Canal, Lake, Des Plaines. I make it up and over the Des Plaines bridge this time and time the light perfectly. I get a delicious whiff of chocolate from the Blommer Chocolate Factory. As I get to the intersection of Milwaukee and Grand I’m surrounded by a pack of fellow cyclists. We all pause for an ambulance, although one fellow has to stop short quickly since he wasn’t paying close attention to the sirens and lights. At Elston I turn off and leave behind most of the cycle pack. This stretch before Division is calm and has light traffic. I recall seeing a guy a few years ago slowly cycling along here as he conducted a conference call on his blue tooth headset. I get caught at the light at Division and am again surrounded by men in sporty cycling gear. They don’t want to put their feet down so they jostle and balance. But the light is long and they eventually concede to gravity. Once the light changes they jack rabbit ahead and I have the road to myself again. This time when I reach Damen I turn. I’m not going straight home, and this is a good route to my destination. I head north up and over the river, gearing down and moving slowly. This is the last big bridge I must cross and I’m grateful. North of Diversey, it’s a delight to cycle Damen on a warm afternoon. The street is lined with trees and three-story housing which blocks the sun and casts cooling shadows. I dawdle along for several blocks, crossing Belmont and Addison with ease. I’m now on Lincoln and continue to pedal north and west. Then I reach my destination where I spend a couple of hours happily visiting and knitting. I eat a sandwich from my pack and drink lots of water. When I emerge later it is full dark. I mount my removable lights on the front and back of the bike: a clear headlight beam for the front, and a blinky red light for the back. I get on my bike and resume my ride. Rather than get caught up in the busyness on Western Avenue, I use Wilson to cross it. I pedal past Waters Elementary and its bountiful gardens to Rockwell, where I turn north again, cross the el tracks, and pick up the bike lane on Lawrence just east of the river. One more bridge to cross, but it is not very demanding here where river traffic is limited to canoes and kayaks. At Kedzie I encounter a bus. Buses are good, bikes are good, but making both of them share a lane is not good. I avoid playing leap-frog with the bus as long as possible, but at Kimball it is still loading passengers when the light turns green. I wait a minute, then decide that I need to pass the bus. I pull abreast of it just as it begins to rumble through the intersection. Now I’m forced to race and my leg muscles are burning. It finally falls back at a stop, but not for long. I continue pushing myself hard. I must not get stuck behind this very full bus or I will forced to either stop every time it does or make a quick foray into the car lane at each stop. At Pulaski it seems like I’m ahead, and so it remains until I finally turn off Lawrence back onto Elston. My hamstrings, quads, and glutes are nearly quivering from the strain. I’m on the home stretch now, and there is no chance I’ll encounter a bus on Elston. Traffic is light and I easily maneuver through the small spot of construction and the last light before I turn onto my street and pull up to the garage through the alley. My dog greets me as I enter the house. I think she likes licking the sweat off my face, but I feel filthy and hot. I take a cool shower, pour myself a glass of whiskey, and pull out my laptop to write. I’ve cycled about 20 miles in total and it’s been a good day. More writing about food today. Yes, I am a one trick pony these days! Plus I had to finally write about all the fun I’ve been having learning about lacto-fermentation, brining, and pickling. Pickles are yummy, and many kinds of vegetables can be pickled so there are infinite variations one can make. Brining and lacto-fermentation are also great ways to preserve foods and even enhance their effect on your health. Even the mainstream media and advertising is touting probiotics. But you don’t need to buy your probiotics from a multi-national company. You can get the benefits of lacto-fermentation from foods other than yogurt, such as sauerkraut, kimchi, and lacto-fermented cucumber pickles. I’m a huge fan of pickled foods and one of the things I love about shopping in the international markets is that I can get fresh pickles for my munching, not mass-produced shelf stable ones. But why not go one step further and make my own? Since I had a huge crop of volunteer dill in my garden this year, I decided to give it a try. I remember my grandmother’s garden was also full of dill and that she made pickles. While I can’t pinpoint my exact age at the time (five years old? six years old? ), one of my vivid memories of grandma’s house was the big crock of pickles sitting in her utility room years. We weren’t allowed to mess with the pickles and had to maneuver around them as we walked from the kitchen into the back yard. For my own foray into pickled cucumbers I had to first get some equipment: a pickling crock. It’s not required that the crock be ceramic, although it’s certainly preferred, and a good fermentation/pickling crock can cost a lot. While I would love to use a vintage crock for my pickling, I just don’t have one on hand (I wish I knew what happened to grandma’s crock). So I started by searching the thrift stores for something suitable to use as a pickling crock. Ceramic crocks are something to be cautious about; some of the crocks that can be found in thrift stores may not actually be food safe, and the same is true of many plastic containers (such as buckets), too. At my second thrift store stop I lucked out and picked up a set of two Tupperware-brand containers that looked very much like crocks. One of them was missing a lid, but a sealing lid isn’t necessary for pickling. (And if you ever are lucky enough to find decent Tupperware at a yard sale or thrift store, remember that the Tupperware lifetime warranty will allow you to order replacement lids if they are missing or damaged; you just have to pay a small shipping fee. Woot!) So for a whopping $1.80 I brought my pickling crocks home and ran them through the dishwasher to get them squeaky clean. My favorite international market was running a special on pickling cucumbers, too. 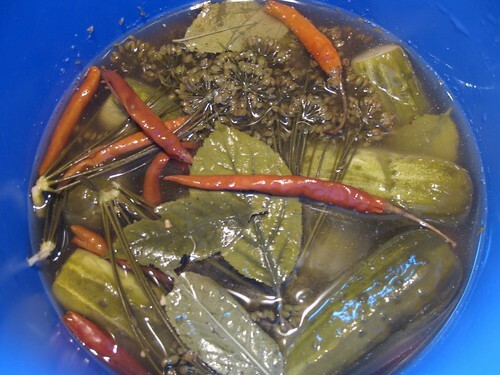 While I would love to pickle cukes from my own garden, the plants weren’t yet producing, and at 49¢ a pound I thought it would not be a great disaster if my pickles didn’t turn out and I ended up dumping them in the compost. I found a great blog with recipes and information on lacto-fermenting cucumbers, followed the advice, and voilá: pickles. In this bright blue three-gallon container, I have four pounds of pickling cucumbers, a few heads of dill, a handful of dried hot peppers, about four cloves of garlic, and some leaves from a sour cherry tree. This latter ingredient may seem odd, but it was recommended that some grape leaves be added to keep the pickles from getting soft. With further research on the awesome Wild Fermentation site I found that cherry tree leaves could serve the same purpose, and I had easy access to leaves on my next-door neighbor’s tree. The brine is basically just pickling salt, water, and a bit of white vinegar. I put a small plate on top of the pickles and force them to stay submerged with a weight, which consists of a bag full of brine. (Just in case the bag leaks, this ensures the brine doesn’t become watered down.) The pickles are supposed to sit for four weeks before they’re ready to eat, and it’s only been two so far. I am quite impatient to give these pickles a try, but I’m holding back! To satisfy my immediate desires for pickled foods I’ve been consuming kimchi purchased from the market. I actually would like to try my hand at making my own kimchi and sauerkraut*, but for now I want to wait and see how my pickled cukes turn out before attempting anything else. Pickled cucumbers are what most Americans think of when we refer to pickles, but there are many other types of pickled foods. How about pickled beets? One of my favorite ways to eat beets is pickled, and when I bought some golden beets at the farmers market the other day I decided to make them into refrigerator pickles. I consulted a few recipes and then realized that I could easily make up my own variation, so I did and placed the single jar in the fridge to sit for a few days. My friend Adrienne stopped by on Saturday on a spur of the moment visit, and she made up some delicious salads for our lunch using the refrigerator pickled beets, walnuts, and some chevré. We finished up the entire jar, but I wasn’t worried; I had more beets on hand that were ready to be transformed. I neglected to weigh the beets before pickling, but I here’s how I prepared them. The original recipe I followed did not call for allspice or onion, but they sounded like good options to me so I added them. If using red beets, be sure to wear rubber gloves as you handle them to prevent staining your hands. Twist off the beet greens and scrub the beets well. Cool the cooked beets in a cold water bath so they can be handled more easily. Slip or peel the beet skins off (using gloves! ), trim the ends, and thinly slice the beets. Using clean, non-reactive containers such as a glass jars or a large plastic container, alternate layers of sliced onion (if using) and sliced beet, leaving about an inch of room at the top for the pickling liquid. Cover/cap the containers and add them to the refrigerator. Wait at least 24 hours before sampling. The pickles should be good in the refrigerator for one to two weeks. It took me less than an hour to whip up those two large jars of pickled beets, and I’m hoping they’ll last me about two weeks. We’ll see. 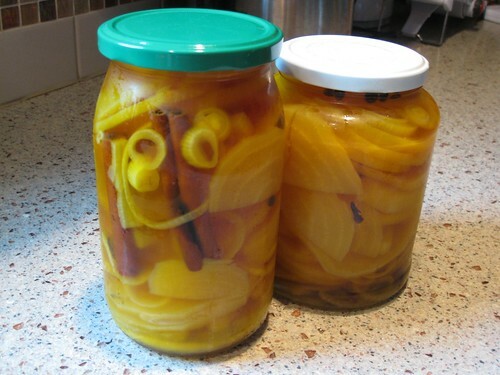 How do you feel about pickled foods? Do you like them or hate them? Have you ever tried to make brined, pickled, or lacto-fermented foods? *Note: if you love sauerkraut but don’t like the um…distress…it can cause your gut, then try rinsing it well before you reheat it. Such a simple step, but one I only recently learned makes a huge difference!